When we got word that Kevin Alston had come down with chronic myelogenous leukemia, plans for well-wishing banners and game displays started almost as quickly as his treatment. We’d have a few weeks to think of it, of course, since there were two road games between then and the next Revs home date. Didn’t take too long to find the right source photo to use, but I was stuck on the caption. I’ve heard that many cancer survivors (and family of those who didn’t make it) that the fight/battle language often used with cancer support slogans carries with it a lot of uncomfortable baggage. 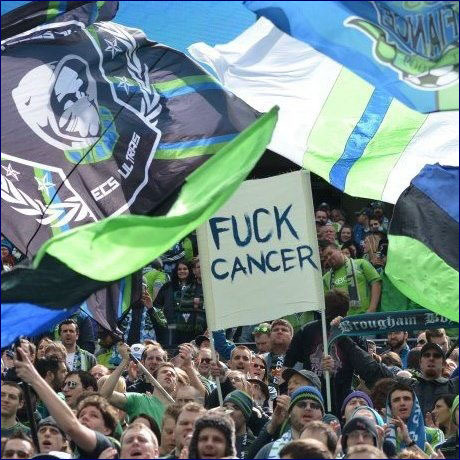 And while the fans in Seattle drew up a sign with the best and most eloquent remark possible, I’d be hard pressed to get it through security. And then it was a week later and a couple yambags set off bombs at the best day of the year in Boston and Matt Reis was there helping to save people’s lives and really everything went bananas for about five days. So now besides “your starting fullback has cancer” we got “your hometown got blowed up, including your goalie’s family.” Now what? I was browsing The Atlantic’s gallery of photo tributes when I found it. It’s a squashed Gatorade cup at the finish line. Any other year, it’s litter. This year, it’s a message. Endurance. Whatever happens, we’ll push through it. Brought it out for the game vs. Philly–a game for which Alston was the image on the season ticket–and the stadium chanted Alston’s name at minute 30 in tribute. (You can see that next to the banner there’s also the tribute I did for Matt Reis and his family, namely just bringing back the old Matt Reis has a Posse banner for the night with intent to give it to him afterwards). Gave it to Kevin postgame, gave Matt his old time banner postgame, and felt great to do so after a multi-goal, clean sheet win. Nothing like handing over banners to two dudes who’ve got the endurance to work on through the whole season. This entry was posted in finished projects, revs. Bookmark the permalink.